The northern province of Quang Ninh is taking all possible measures to ensure absolute safety for tourists when visiting the locality, home to UNESCO-recognised world natural heritage Ha Long Bay, affirmed Vice Chairman of the provincial People’s Committee Le Quang Tung. Tung made the confirmation at a press conference on May 6 after a cruise ship caught fire in Ha Long Bay on the same day. 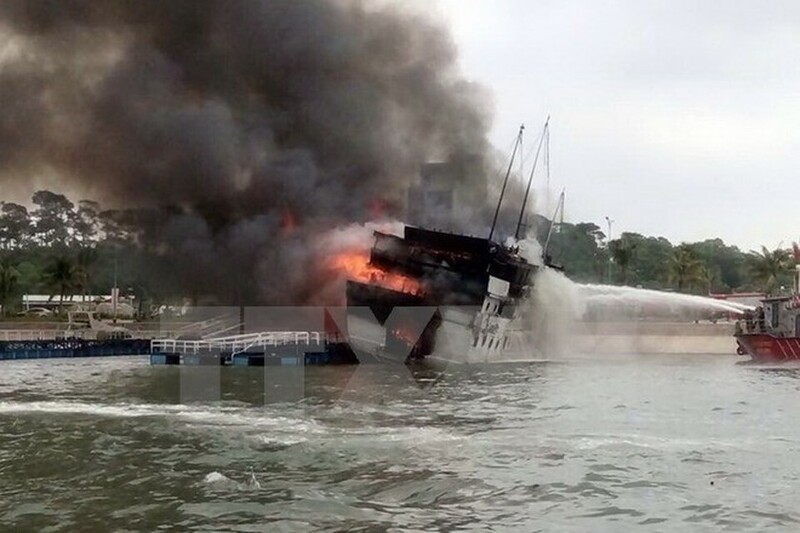 The cruise ship, coded QN 6299 and owned by VIT Tourism One-member Limited Company, caught fire when it had just arrived back at Tuan Chau port after touring Ha Long Bay. 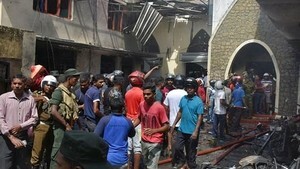 All 37 tourists aboard, including 36 foreigners, were brought to shore safely after they jumped off the burning ship. Tung said that after the incident, all boats belonging to the company had to stop operating for inspection. He told reporters that to manage the tourist ship fleet on the bay, Quang Ninh has put forward a lot of regulations, especially after a ship sank in Ha Long Bay in early 2011, claiming the lives of 12 foreign tourists. The province recently issued a temporary regulation that allows wooden ships to operate in the bay for a maximum of 15 years, as opposed to the 25 years regulated in Decree 111/2014/ND-CP. The change was made for safety reasons, as this type of ship degrades more quickly in saltwater and is more affected by strong winds in Ha Long Bay. After the 15 years, they can still travel outside the bay. Passenger ships will soon be banned from staying overnight in Ha Long and Bai Tu Long bays, local authorities in the northern province of Quang Ninh said. In the near future, only daytime travel will be allowed in the sea. Currently, there are 533 tourist ships operating across the two bays, 202 of which dock overnight there and 81 percent of which are wooden ships. However, Quang Ninh is striving for no wooden ships operating in Ha Long Bay by 2030. Quang Ninh aims to welcome five million tourists to Ha Long Bay by 2020, up from 2.2 million in 2015. Ha Long Bay, which spans 1,553 square kilometres and includes 1,969 islands of various sizes, was twice recognised as a UNESCO World Heritage Site in 1994 and 2000. In 2011, it outranked 261 other landscapes from around the world to be voted one of the seven New Natural Wonders of the World.